In a time in which English plays a more and more prominent role in Dutch society, with the effect that a considerable number of Dutch people of various professions are constantly exposed to English, there is a growing need for a systematic comparison between these two languages. 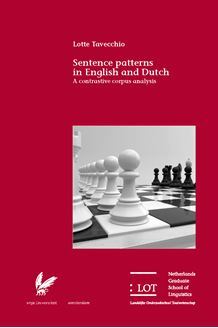 As the majority of existing contrastive studies are either predominantly qualitative in nature or largely intuition-based, the aim of the present study is to gain insight into the differ­ences between these two languages at the sentence-level by performing a quantitative, corpus-based analysis of nearly 17,000 sentences, divided across two languages and the four genres of academic journal articles, newspaper articles, short stories and public information leaflets. A detailed discourse-grammatical analysis of these sentences has uncovered the main sentence patterns in English and Dutch. It has also tried to establish the extent to which sentence structure is determined by the linguistic system of either language, by the genre in which a sentence is written, or by the inter action between these two. This study has provided insight into the rhetorical design of sentences in four different genres at both the levels of the individual languages and the languages in contrast.